Growing up in the fish-filled Ozarks, with older brother Ben Levin to blaze a trail as a fly fishing guide, it’s easy to see why fishing came naturally to Gabe. As a child he could ... moreusually be found playing in the Little Mulberry creek, splashing along in his brother’s footsteps until Ben stuck a fly rod in his hand, probably to try to get rid of him – it did not work. Gabe spent every summer of his teenage years wading or paddling a canoe in search of smallmouth and trout, sometimes venturing out to Idaho to be guided by brother Ben on the South Fork and Henry’s Fork of the Snake River. College kept Gabe busy for four years with studies, a summer farm job, and learning to throw a cutter as a relief pitcher for the Hendrix Warriors baseball team. After college, Gabe spent a year working on a sustainable farm and marketing local foods in central Arkansas before the allure of the fishing business drew him once more into his brother’s footsteps. Gabe began working full time for Dally’s Ozark Fly Fisher in August of 2013 and has been guiding since October 2013. At just 25 years old, he’s the new kid on the block so to speak, but he’s a quick learner and has a humble way of absorbing advice from the experienced crew that surrounds him. 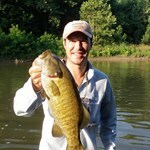 Gabe enjoys sharing his knowledge of Ozark streams and rivers with anglers of all ages and skill levels. He offers float trips from a drift boat on the trout filled White and Norfork tailwaters, as well as kids’ fishing for trout on Dry Run Creek. A bit of a smallmouth addict, Gabe loves leading canoe or wade fishing trips on his home waters of Crooked Creek, and has begun an annual quest to the upper Midwest for trophy bass on the fly. Beginning in 2015 Gabe will add a jon boat to his arsenal and will offer drift boat trips on the Buffalo National River for incredible smallmouth fishing and sight seeing. Ben Levin used to be known as "The Kid" around the crusty older types here at the Ozark Fly Fisher, before the beard, but he's packed more fly fishing experience than most twice his ... moreage. Getting Ben into the team here was a huge bonus. He's been a fishing buddy and worked with some of our guide team for years and we finally wore him down. You will really enjoy meeting him in the shop as well. We like to say he is the nice one. Ben Levin was born and raised in Arkansas on the headwaters of the Mulberry River, and started chasing fish, crawdads, tadpoles, turtles, snakes, and all other manner of creatures in creeks and puddles since he was old enough to walk. He has been catching trout and smallmouth bass on fly rod in the Ozarks since age eleven. Having spent most of his childhood exploring every nook and cranny of Ozark creeks, rivers, tailwaters, and reservoirs, Ben has a special passion for his home waters. He has been guiding fly-fishermen on the White River system since age fifteen. Between college semesters, Ben spent four seasons working and guiding for South Fork Outfitters on the Snake River, and Mike Lawson’s Henry’s Fork Anglers on the Henry’s Fork in Idaho, one of the most famous and challenging dry fly rivers in the west. He has also traveled all over the Rockies fishing in Montana, Wyoming, Colorado, New Mexico, and Utah. 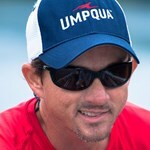 He was a member of the US Youth Fly-fishing Team in ’98 and ’99, and competed in Ireland and Wales. 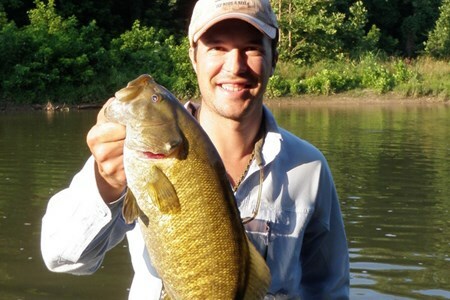 Ben has been longtime friends with local fishing expert and renowned artist Duane Hada, and the two often team up to float people down our smallmouth streams. Since graduating in 2005 from the University of Arkansas in Fayetteville with an honors degree in English, Ben has been guiding full time here in Arkansas on our local waters. He lives on Crooked Creek, our famous smallmouth fishery and major tributary of the White, where he fishes, writes, takes pictures, hunts critters, and spends time with his chocolate lab, Soco. Ben will be doing both smallmouth and trout trips for us, whether it’s in a canoe on the creeks, or his jon boat or drift boat on the river. He’s also a heck of a fly tier and supplies several of our custom patterns. You'll enjoy meeting Ben and Soco. Steve was raised on Australia’s island state of Tasmania, in Aussie fly fishing terms the equivalent of being raised in Montana. But he'll tell you he squandered his youth in the salt, ... moresurfing, diving, and fishing for all manner of species including tunas. Finally convinced in his late 20s to grasp a fly rod, an obsession was born. 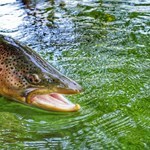 He cut his teeth on the challenging wild brown trout and rainbows of Tasmania’s wilderness lakes and streams before moving to the US in December 2000. A former journalist, Steve spent 3 years in the US as a traveling fly fishing writer and photographer, a job which saw him land, fly rod and camera in hand in Montana, Wyoming, Alaska twice, Baja, New York, Michigan, New Mexico, Idaho and finally Arkansas. The experience in tackling North American conditions was invaluable as he fished the mayfly hatches of the Henrys Fork, Firehole and Au Sable, caddis hatches on the Big Wood, chuck and ducked beads on the Kenai, stripped streamers on the Beaverhead, splatted hoppers on Silver Creek, found himself tied to 40lb King Salmon on the Ayakulik, and roosterfish and snook in Mexico. His articles and photographs have appeared in several Australian publications and websites, and he remains a masthead columnist and regular contributor on tactics, destinations and fly tying with Australia and New Zealand’s premier fly fishing magazine FlyLife. After flirting with guiding, and several job offers on his travels, Steve started guiding out of the Beaver Dam store, in '04 and ran the fly fishing department, building his knowledge of the White River system from Beaver to Norfork and a substantial and loyal guide clientele, before joining the Mountain River Fly Shop in Cotter in ‘07. 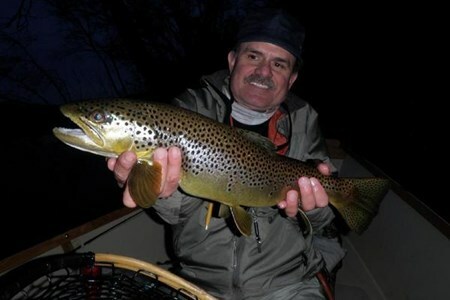 Despite a serious and extensive fly fishing resume, Steve’s laid-back Aussie accent and attitude, sense of humor and self-deprecating wit are appreciated by beginners and experienced fly fishers alike. 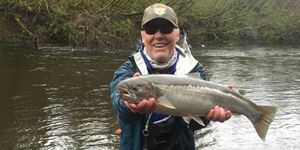 His mantra is that fly fishing is meant to be fun whether you are catching the biggest fish of your life, tangling around the rod tip and everything in between. He's also been known to describe guiding as like a "duck swimming across the pond" and all the hard work gets done our of sight to make the day as easy and relaxed as possible. Hello fellow anglers, my name is Chad Johnson, born in Mississippi in 1973, with rod in hand. I spent the next 32 years in Crystal Springs. My dad was an angler & raised me just ... morea 4-wheeler ride away from two great warm water fisheries, where we spent most of our time fishing for Catfish, Bass, & Blue Gill but never with the passion that I have found in fly fishing. 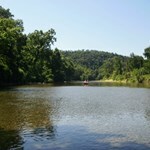 I began coming to the White River area for the first time in the spring of 2003 to fish for trout and small mouth bass. That's all it took to get me hooked and I begin making as many trips as possible to fish the area. Sometimes getting sidetracked fly fishing for Redfish on the coast but was always drawn back to the White River area. In 2006, I decided trips were not enough; I sold my house, left my business and moved to the White River Area to pursue a career in fly fishing. Not long after making the move I joined my new fly fishing family at Mtn. River Fly Shop in Cotter AR, which is now known as Dally’s Ozark Fly Fishers. They began letting me cut my teeth on guide trips with kids to Dry Run creek and teaching them the fun of fly fishing. I soon bought a Drift boat & began guiding on the White & Norfork Rivers in 2007. In the summer of 2007, I found myself guiding at the Rocky River Lodge in Port Graham, Alaska for Salmon & Dollies season & again in 2010. Meanwhile, I worked the rest of the year at Dally’s Ozark Fly Fishers and guiding part time. Over the last couple of years, I have found myself so busy with guiding that I have not been able to work in the Fly shop full time. I am now finding myself overwhelmed with the pursuit for big fish on big flies. I guess the bottom line is there’s no better place to be than in the boat with a customer sharing this sport. I love my job! I had no idea that my move from Mississippi would land me on such a fast track to such an awesome fly fishing career. Now being an ambassador for Simms Fly Fishing and being picked up as a Rio ambassador and being picked as a Fly Designer for Umpqua Feather Merchants, this move has been the best thing that has happen to my wife, Tiffany, and I in the last few years. Thanks to all of the support of the fly heads out there. 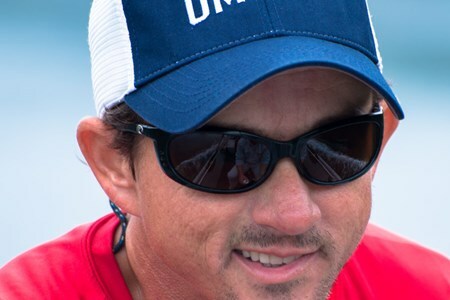 Kevin Brandtonies was born in Chicago IL in 1968; He has been fishing since he was 5 years old. His first trip to this area was in 1974, where his father Larry Brandtonies fell in ... morelove with the White River and brought his family here every year. Kevin worked as a first mate on charter boats out of Chicago on Lake Michigan, for six years he trolled for Salmon and Trout. He eventually went into the securities business and still vacationed here every year. Dreaming of the day he could come here and stay for good. Kevin moved to New York and worked on the American Stock Exchange until one day his emotions got the better of him in May of 2000. He left the “Big Apple” and moved here to chase his dream of being a professional guide. Since that time he’s never looked back. “Fishing” especially Fly Fishing has been his passion. Kevin enjoys teaching children and “first timers” So no matter if you are a seasoned veteran or a first timer you will enjoy fishing with him. Tangles, lost flies, missed fish don’t bother him. As he puts it, “don’t worry about it, that’s what I’m here for”. If you’re ready to have a stress free fun day, call and book a trip with Kevin. Starting in the mid to late 50's Marc began fishing popping bugs with his father on the upper White, War Eagle, and Osage Rivers in NW Arkansas. This kindled an interest in fishing ... morethat gets brighter every year. After high school in Tulsa, college at OSU, and a term with the US Navy; Marc was free to pick the places he spent time. Most of these were chosen because of the fishing available. Belize, Panama, Virgin Islands, Mexico, Canada, Alaska, California, Oregon, Washington, Wisconsin, Texas, New Mexico, Colorado, (and a few other places) he has tossed a line and hopes to fish again someday. Twenty two years ago Marc returned to the White River Basin which he considers home. The desire to spend more time on the rivers finally pushed him to move to Cotter and to pursue a career in guiding people in this area we call the Ozarks. He has discovered that he gets much enjoyment and satisfaction out of putting people on fish and helping them to catch those fish. Helping clients develop the skills and predatory instincts to be successful on their own is a top priority. Marc has been accused of being meticulous in the ways he approaches his fishing and tackle preparation. To him this is part of the fun and adds to the passion for the places and people that come together in pursuit of game fish. Wade fishing is his first and favorite way to fish. ( because it satisfies that hunter-gatherer instinct). But on these waters many times a boat can be a necessary tool. For that reason he has a 20ft. motorized Jon boat and a 16ft. drift boat. Marc does not adhere to the "9 to 5" schedule for guiding. If conditions dictate, he will be on the water at 5am or 8pm and even at night if that is what it takes. Known for his humble and sincere nature Marc invites all who are interested to come fish with him. I always feel incredibly lucky that Davy Wotton is part of our extended family around this fly shop. Davy has devoted his life to fly fishing on two continents and legitimately should ... morebe regarded as an international guru. He has many, many flies in commercial production both here and in the UK, was an innovator in the fly tying materials business, a writer, photographer, entomologist, casting instructor and out standing all around fly fisher. I've been asked a bunch of times by people, does he really know that much?, well the simple answer is yes, and its knowledge learned from years of obsessive water time and sitting at the vice. 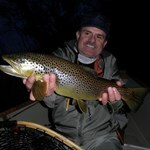 Davy also supplies many of our most productive custom patterns, his Sowbugs are standards as are his Super Midge series. His Master Tying Classes are not to be missed. Its also a lot of fun having him as a friend. A little History on Davy - My fly fishing days began in the 1950s fishing for wild browns on a river that ran through the family farm in the western region of the UK. While at school l was given some fly tying material which further spurned my interest, not to mention the availability of fur and feather that l obtained from the creatures that frequented the local countryside, that also created my interest in hunting. In the late 60s having achieved fly tying skills l started to produce flies for a local fishing tackle store, that lead further to being asked to write regular fly fishing articles for a fly fishing publication that further encouraged me to set up a mail order business selling flies, that then lead me to expand my business to include fly tying materials and then fly fishing products. In the early 80s my interest l started to process fly tying materials, learning how to take care of raw material and dying material. In those days the availability of dubbing material was limited more so to natural material such as mole, rabbit, seals fur and only available in limited dyed colors. That furthered me to spend time developing a new ranges of dyed material using at that time natural fur. The first of which was the Davy Wotton hare fur dubings in 12 colors. Also at this time l was being booked to give both fly tying and fly fishing lessons and guides services both for rivers and stillwaters, both in the UK and overseas. Ultimately that took me to very many countries around the world demonstrating my skills and teaching fly fishing. It also got me interested in competitive fly fishing events which were more or less at that time confined to the UK, now on a worldwide basis. During those 18 years l won many events, it also furthered my development of new fly patterns and techniques for fishing, over and above what was then the accepted standards. During the 80s seal fur which was more or less the standard for very many flies became very difficult to obtain. That got me interested in so far as how synthetic materials could be utilized. In consequence after 2 years of research and figuring out combinations of what materials and blends to use, SLF was introduced into the world market. My company expanded rapidly to be able to support the international demand. More or less l have fished every State in the US, guided anglers at many destinations around the world, worked for and produced many fly fishing shows for national TV networks, alongside my own Fly Tying and Fly fishing video and DVD programs and well over 300 articles published in International fly fishing publications and fly fishing forums. It was my good friend Dave Whitlock who first introduced me to the White river system, to say the least l was hooked by the resources here in Arkansas, and in consequence decided l would move here from what was at that time my homes both in Wales and Chicago. Since that time l have introduced for the White river system many new fly patterns not to mention bringing with me the many of the traditional and techniques established back in the UK during the 1800s, and those of a more modern concept generated by the international world of competitive fly fishing. It is the way of the wet fly that holds a passion for me more than any other fly fishing technique, sadly today a technique not often used or understood, but it is one of the most deadly ways to catch trout no matter in what water they live if the prevailing conditions are conducive to its use as is the case for any other method on its day. 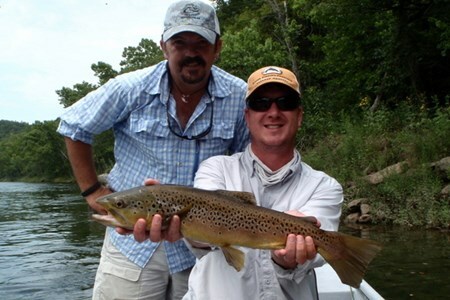 Looking for the best guided fly fishing trips in Cotter, Arkansas? 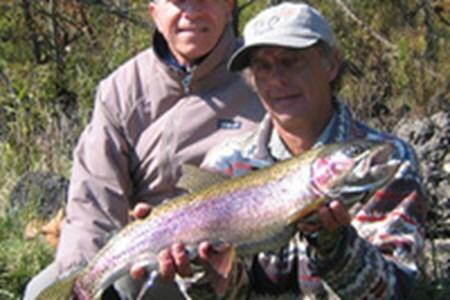 Choose from the top Cotter, Arkansas fishing guides. 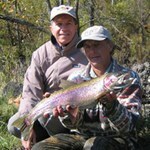 Read reviews, compare prices and check availability for fly fishing guides in Cotter, Arkansas. 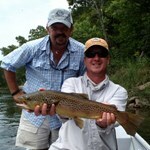 Yobi Adventures has everything you need to plan a Cotter, Arkansas fly fishing vacation. 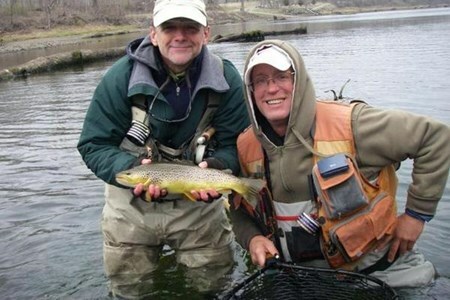 Find the right fishing guide for your Cotter, Arkansas fly fishing trip. With hundreds of fishing guides to choose from, Yobi helps you plan the perfect fly fishing adventure. 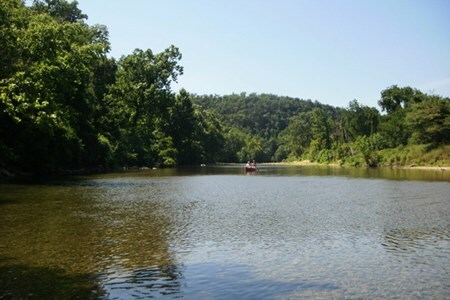 Browse the top fishing guides in Cotter, Arkansas and book a trip online.